Dave Miller spent every summer as a child playing in the caves surrounding Greenville, West Virginia, deep in the Appalachian mountains. This started a series of lifelong coincidences that one day would draw him back to very place he started his adventure. This life journey would prepare him somewhat for what he would find one day buried on the side of the mountain that contains the graves of his ancestors. Dave has been a contributor to Smithsonian Magazine, Ancient-Origins.net, and Paranormal Underground Magazine. 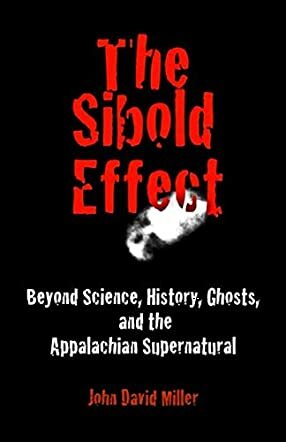 The Sibold Effect: Beyond Science, History, Ghosts, and the Appalachian Supernatural by John David Miller is a memoir about a seemingly random piece of property in the Appalachian Mountains that the author purchased. But as the author began researching the property, he discovered that he had a connection with the property. His historical research, laid out in The Sibold Effect, connected his family and the property with historical figures like George Washington and important iconic battles in the Revolutionary War and the French and Indian War. But it wasn't just history that John David Miller dug up. During the project's remodel, supernatural events occurred that are also chronicled in this chilling memoir. John David Miller asks, was it all a coincidence? Or was he drawn to this property by some supernatural power that wanted to reconnect him with his family and his history. The Sibold Effect is an interesting memoir because it is part historical non-fiction and part ghost story. On top of that, John David Miller poses an interesting question about coincidence. Could all of the events that came together have been by chance? And if they weren't random, what power brought them all together? John David Miller presents his argument in a strong, engaging way that is easy to believe. Even if you aren't a believer in ghost stories, it is easy to understand John David Miller's argument. He is obviously very passionate about his belief in history, family, and the supernatural powers that bring them all together. For what purpose...still remains to be seen.